Pizza is always less tasty after several hours, but it is very common that we are unable to finish up the whole pizza at once, especially when we are alone. So, what would you do if you are in a hotel room, in where that you are hardly to see a microwave? 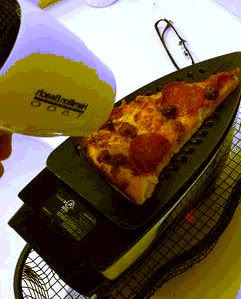 Well, we could always utilize the hotel style microwave! Find yourself with Hair-dryer and iron, and that’s it! Additionally, it is much better if you could get yourself with Aluminium Foil as well.